The Gate of Athena Archegetis, entrance to the Agora of Athens during the Roman times. 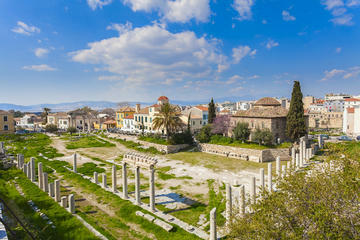 ​What we call today The Roman Agora of Athens is a large paved square, 112 m. long from west to east (370 ft.) by 96 m. (316 ft.) broad, constructed symmetrically with Hadrian's Library, in parallel direction and analogous dimensions. A peristyle surrounded by exterior walls, and an interior court 82 m. by 57 m. flagged in marble. ​​The columns of the peristyle, with double halls, was of the ionic order with a smooth shaft. The further end of the peristyle, the interior hall, was divided into several shops 6 meters deep, testifying to the fact that this was a mercantile Agora. In the SW angle a marble Fountain stood, fed from the water of the Klepsydra, called the Agoranomion, the station for the police of the market which was later restored by Herod Atticos. The propylon (entrance) towards the west side, raised between the year 12 B.C. and 2 A.D. at the expenses of Julius Caesar and Augustus, is preserved to our days in a satisfactory state, is known under the name of Gate of the Market, or Gate of Athena Archegetis. During the Byzantine period and the Turkish occupation the area was covered with houses, workshops and churches including the surviving Fetiye Mosque. After the necessary purchase and demolition of the private houses and other buildings covering the area, a series of excavations were carried out. View of the Acropolis from inside a Plaka Hotel room. In the vicinity of the Roman Agora, we recommend Plaka Hotel, a family hotel which is an excellent value for the money, rated as "fabulous" by hundreds of Booking.com guests. Just a 5-minute walk from Syntagma Square and 2 blocks from Monastiraki Metro Station the hotel has a rooftop bar with breathtaking views of the Acropolis and across Athens. The 24-hour reception can help you with travel services in Greece and organize day trips around Athens. The elegantly decorated guest rooms at Hotel Plaka include a minibar, safe, free Wi-Fi, and A/C. Most rooms have balcony with views of the Acropolis, Plaka or Lycabetus hill. A rich breakfast buffet and a Greek breakfast are served between 7 am and 11 am. 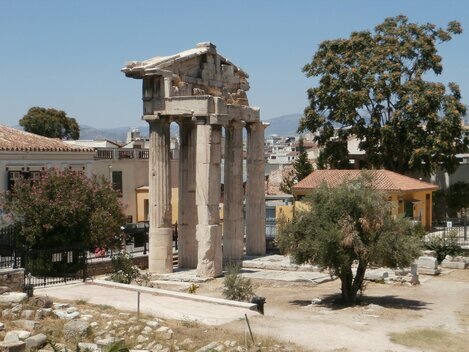 on this three-hour private walking tour of Athens.